3 bed,2 bath duplex, air conditioning, satellite tv, Free WiFi, Community pool, full kitchen, Close to beach,golf,restaurants,pubs. Quiet,secure urbanisation.Sleeps 6. Suit families. No.60, Amapolas 2, is a three bedroom duplex apartment in a small urbanization which includes car parking, community pool, private entrance with security gates. It is located in the beautiful residential area of La Zenia , 6 km.south of Torrevieja. ·	Fully fitted kitchen, c/w washing machine, fridge/freezer, oven, hob, microwave. ·	Comfortable lounge, Satellite TV, free WiFi. The upstairs bedroom and sun patio are both accessed via an external stairway which may not be suitable for very young children or the elderly. where you can buy anything from a needle to an anchor. ·	10 min. drive south of Torrevieja, with all its shops , markets, promenades and marinas. ·	within walking distance of shops, restaurants, bars. are open to the public). The town of Torrevieja is situated 45km. south of Alicante airport. 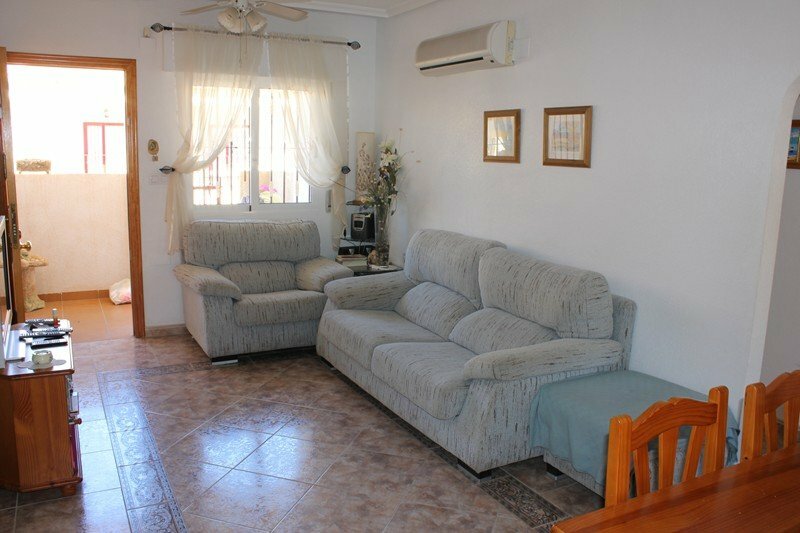 Our apartment is situated in La Zenia,which is 6 km. further south,a journey that takes approximately 45 minutes by car. This fabulous area has safe sandy beaches that seem to go on forever, most of them proud to display the award winning Triple Blue Flag for cleanliness and safety. Bustling Spanish fishing villages, numerous marinas ,and an excellent selection of Championship golf courses are but some of the attractions of the area. The whole area is surrounded by orange and lemon groves with two central lakes, one of which is home to flamingos and wild migratory birds. The area is known as the Market Garden of Europe with its plentiful daily markets displaying a mouth watering display of fresh fish, meats fruit and vegetables. The Southern Costa Blanca has been recommended by the World Health Organization as one of the healthiest places to live in Europe.